FORT WORTH — Monsignor Joseph Arthur Schumacher, 86, a longtime priest for the Diocese of Fort Worth, died Nov. 1, 2018. Msgr. Schumacher will lie in state at Thompson's Harveson & Cole Funeral Home, 702 8th Ave., from 12 to 5 p.m. on Sunday, Nov. 4 and continuing at 9:00 a.m. on Monday. At 5:00 p.m. on Monday, visitation will begin followed by a Rosary at 7:00 p.m.
Fort Worth Bishop Michael Olson will preside at a Mass of Christian Burial on Tuesday, Nov. 6 at 11 a.m. at Holy Family Catholic Church, 6150 Pershing Ave., in Fort Worth. Interment will follow at Mount Olivet Cemetery. After more than 60 years as a priest, Msgr. 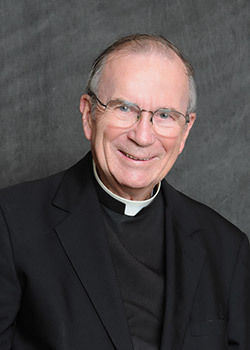 Schumacher retired in 2006, having served as pastor of St. Matthew Parish in Arlington, St. Michael Parish in Bedford, and Immaculate Conception Parish in Denton, among others. Born in Independence, Kan., on March 19, 1932, Msgr. Schumacher was the middle of three children of Arthur and Margaret Schumacher. His family moved to Fort Worth when he was in third grade, and he attended St. Ignatius Academy, located next to what is now St. Patrick Cathedral, through the eighth grade. After completing Catholic college prep school in Amarillo, Schumacher attended college and seminary at Pontifical College Josephinum in Columbus, Ohio. He earned a doctorate degree in sacred theology at the Pontifical University of St. Thomas Aquinas in Rome in 1967. Ordained to the priesthood on May 25, 1957 for the Diocese of Dallas-Fort Worth, Father Schumacher served as an assistant pastor for several Dallas parishes. He was appointed chancellor and secretary to Bishop Thomas Gorman of the Diocese of Dallas-Fort Worth from 1961 to 1967. Assigned as pastor of Immaculate Conception Parish in Denton in 1969, he transitioned to the Diocese of Fort Worth when the dioceses divided later that year. He continued to serve at Immaculate Conception until 1980 and provided campus ministry at the state colleges in Denton. He was designated as monsignor in 1974. In 1980, Msgr. Schumacher became pastor of St. Michael Parish in Bedford for 13 years. He also was pastor of St. Matthew Parish in Arlington from 1994 to 2006. Concurrent with his responsibilities as pastor, he was named vicar general for the Diocese of Fort Worth in 1981 by Bishop Joseph Delaney. He remained at that post for 24 years under Bishop Delaney and one additional year under Bishop Kevin Vann. Msgr. Schumacher was preceded in death by his parents and his brother, Robert Joseph Schumacher and his wife, Edith, and a nephew, Stephen Andrew Gladbach. He is survived by his sister, Margaret C. Schumacher Gladbach, and her husband, Jack; and their families. Memorial contributions can be made to Educate the Children - Honduras. FORT WORTH — Msgr. Joseph Arthur Schumacher, 86, a longtime priest for the Diocese of Fort Worth, died Nov. 1, 2018.